Mosul, in Northern Iraq, is the country's second largest city and the north's major center for trade, industry and communications. Situated in the northwestern part of the country, on the west bank of Tigris, and close to the ruined Assyrian city of Nineveh, Mosul is called Al-Fayha' (the paradise), Al-Khadhra' (the green), and sometimes described as the Pearl of the North. In this article, the history of the city is narrated and the contribution of its scholars to Muslim Heritage in various domains is described through notable examples. 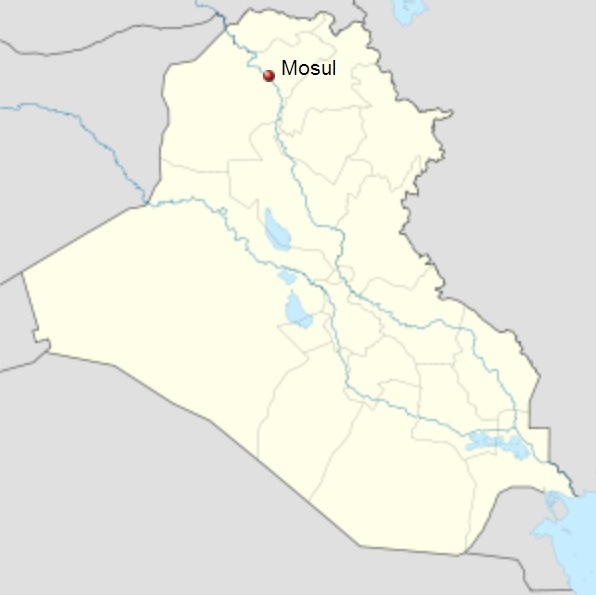 Mosul, Al-Mawsil in Arabic, on the west bank of the Tigris, opposite the ancient Niniveh, is the capital of Diyar-Rabi'a, forming the eastern part of the province of al-Djazira in Iraq. Mosul takes its name from the fact that a number of arms of the river Tigris combine to form a single stream . The town lies close beside the Tigris on a spur of the western steppe plateau which juts out into the alluvial plain of the river. Close besides its walls are quarries in which the plaster for the buildings and for the mortar is obtained . After the taking of Niniveh by Utba b. Farkad in 641 CE during the reign of Caliph ‘Umar I, the Arabs crossed the Tigris whereupon the garrison of the fortress on the west bank surrendered on promising to pay a poll tax  and consequently obtaining the permission to go where it pleased . The new governor of the city Hartham b. Arfadja al-Bakiri settled Arabs in houses of their own and made Mosul a camp city in which he also built a mosque. The city's chief of police Ibn Talid paved the town and built a wall around it. According to the geographers Ibn Fakih and Yaqut, the Umayyad Caliph Marwan II organised the city's administration and built roads, walls and a bridge of boats over the Tigris . The foundation of a mosque was also ascribed to him and under him Mosul became the capital of Al-Djazira province. Figure 1: Map of Iraq, showing the location of Mosul in the northern provinces. In 1095-1096 Mosul passed under the rule of the Seljuks. This was a crucial event and also a most extraordinary coincidence in history, for in the same year (1095), thousands of miles away from Mosul, in France, Pope Urban II launched the crusades. An amazing coincidence, for, as will be amply explained in the final part of this article, it was Mosul, in particular and its ruling Seljuk dynasties which were to play the most decisive role on the Muslim side against the crusaders in the subsequent decades (1096-1144) . Exactly like Cairo in the period 1260-1291, it helped in organizing the resistance of the Muslim provinces of the Middle East . It is indeed extraordinary how Mosul fell to the Seljuks just in time to play the decisive role that will be described further on. It is also astonishing how Cairo fell to the Mamluks in 1250, just precisely when the Mongols and their Christian allies in the 1250-60s were about to exterminate the cities and lands they conquered. Both places were strategically placed for both deeds, which is remarkable especially when also considering that the Seljuks did nearly all the fighting against the crusaders in the first crusade (1096-1144), and only the Mamluks were left to fight the Mongols in 1258-60. Had either the Seljuks or the Mamluks not been on the scene, the events would have been quite different and the course of history in the region would have been profoundly different. "is the metropolis of this region. It is a splendid city, beautifully built; the climate is pleasant, the water healthy. Highly renowned, and of great antiquity, it is possessed of excellent markets and inns, and is inhabited by many personages of account, and learned men; nor does it lack a high authority in the Traditions, or a celebrated doctor of the law. From here come provisions for Baghdad, and thither go the caravans of al-Rihab. It has, besides, parks, specialities, excellent fruits, very fine baths, magnificent houses, and good meats: all in all the town is thriving. However, the gardens are remote from the city, the sound wind is noxious, and the level of the water is far from the surface of the ground, so as to make the drawing of it difficult ." Figure 2: Quran frontpiece from Mosul dated to 710 H. (Source). "The town is in the form of a taylasan just as is al-Basra, and is not large in size. Along one third of its boundary is a building like a fortress, called al-Murabba'a (the square). It lies on the river Zubayda, and is known as Suq al-Arbi'a' (the Wednesday market). Within is an expansive area in which the hired people and the harvesters congregate, and at each corner of the area stands an inn. Between the mosque and the river bank is the distance of a bow shot; it is built on a higher ground, and is approached by steps from the steps towards the river: fewer steps are on the market side ." It is entirely surrounded by arched galleries of banat (a soft marble stone). The front of the roofed part of the mosque is without any doors. Most of the markets are roofed . According to the geographer Al-Qazwini, the town was surrounded by a deep ditch and high walls; the city walls which had strong towers ran down to the river and along its bank; a broad highway connected the upper and lower towns. In front of the walls suburbs stretched into the distance with many smaller mosques, inns and baths. The hospital was celebrated. Most houses in Mosul were built of tufa or marble (from the Djebel maklub, east of the town) . 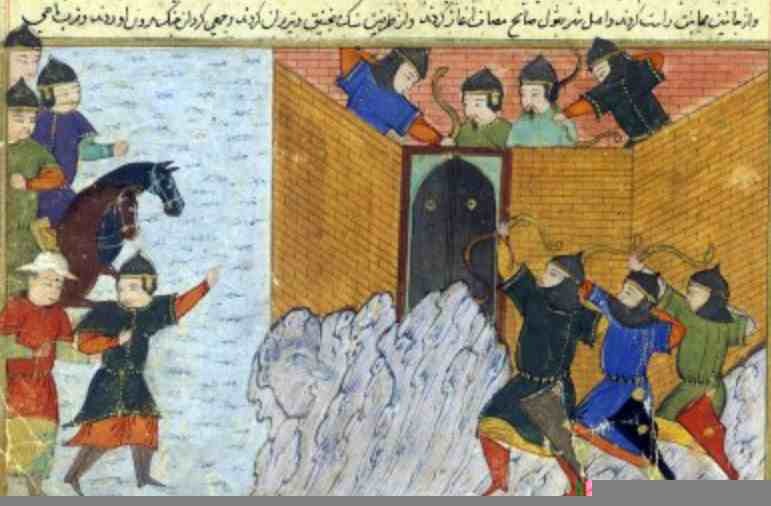 Figure 3: Siege of Mosul (1261–1262) in Jami' al-tawarikh, by Rashid-al-Din Hamadani, painting dated 1430. Bibliothèque nationale de France, Département des Manuscrits, Division orientale, Supplément persan, MS 1113, fol. 190. (Source). Mosul developed considerably under Imad Zangi (d. 1146). He gave it splendid buildings; the fortifications were restored and flourishing gardens surrounded the town . A distinctive variant of the Iraqi style of brick construction was used in Mosul during the late 12th and early 13th centuries. Important public buildings were erected under the patronage of both the Zangid rulers (1127-1222) and Badr al-Din Lu'lu' (ca. 1222-1259) . Surviving from this time are parts of a palace, with lavish stucco ornament and several shrines in which geometric decoration similar to that used in contemporary Baghdad is combined with richly carved arabesque designs often set in niches . Badr Din Lu'lu' also patronized manuscript illuminators and metalworkers. Because of political and economic instability, many Mosul craftsmen moved to Syria and Egypt during the latter decades of the 13th century . Wherever they were produced, the manuscripts used the compositional schemes and pictorial conventions developed in Iraq and found in 13th-century manuscripts from Baghdad and Mosul . More securely localized is the production of inlaid metalwork. Here too, however, some of the craftsmen working in Aleppo and Damascus appear to have come from Mosul, a situation that emphasizes the cultural links between northern Iraq and Syria . Mosul was also a great industrial centre. Sources record crude oil production in Iraq where there were seepages on the eastern bank of the Tigris along the road to Mosul. Muslim travellers reported that it was produced on a large scale and was exported . Petroleum was an important product in Islamic economic life centuries before it attained its present global significance. Crude petroleum (naft) was extracted and distilled extensively; it had both military and domestic uses . Crude oil was usually called black naft and the distillate, white naft, even though some of the crude oils were colourless in their natural state. We have a number of descriptions of the distillation process in Arabic writings, as in al-Razi's Book of Secrets. From this we learn that the crude oil was first mixed with white clay or ammonium chloride (i.e. sal ammoniac) into "a dough like a thick soup" and then distilled. The light distillates, i.e the white naft, were used by him to "soften or loosen" some solid substances, such as certain gems and minerals . Figure 4: Coin of Badruddin Lu‘lu (bronze, 8.81 g) minted in Mosul in the Zangid period, 521-648 H/ 1127-1250 CE. Harvard Art Museums, Department of Islamic and Later Indian Art, Division of Asian and Mediterranean Art. (Source). "All the cloths of gold and silk that are called Mosolins are made in this country; and these great merchants called Mosolins who carry for sale such quantities of spicery and pearls, and the cloths of silk and gold, are also from this Kingdom ." "At Mosul ‘Boucassins' (Bughasi) of great price, are made… The black stuffs of Mosul are quite lovely ." "Near this province (Mosul) is another called Mus (Mush) and Mardin, producing immense quantities of cotton from which they make a great deal of Buckram and other cloth ." 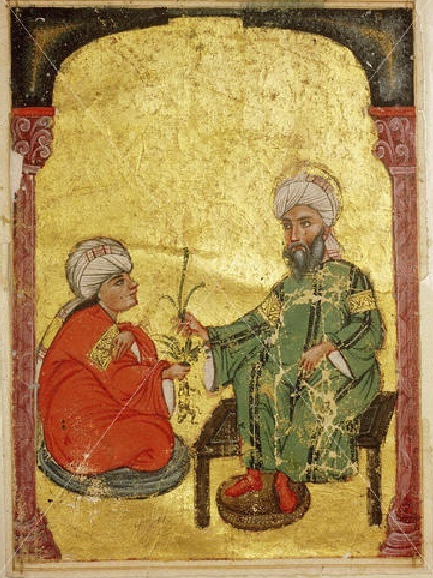 Figure 5: Scene from an Arabic version of Dioscorides' Materia Medica depicting Dioscorides and a disciple holding a mandrake, by Yusuf al Mawsili (Mosul, 1228 CE), in the Topkapi Palace Library in Istanbul. (Source). Hospitals were built all over the country and the hospital in Mosul is referred to by the Spanish Muslim Ibn Jubayr who said that during his visit to Mosul in 1184 CE he learned that the prince of that city, Mugahad al-Din, had built a mosque on the banks of the Tigris in the city of Mosul and a hospital facing the mosque . The first scholar was a rarity - a philosopher by the name of Bakr b. Kasim Abi Thawr al-Mawsili (fl. first half of the 10th century). He is known as the author of an epistolary philosophical work entitled Fi' al-Nafs (Concerning the Soul) which was written between 900-950 CE . The treatise was sent to the illustrious translator and doctor Abu ‘Uthamn Said b. Yaqub al-Dimashqi . The author seems to have lived in the Mosul area and is not to be confused with another philosopher from the area, Ibn Abi Sa'id al-Mawsili. The text of the treatise Fi al-Nafs deals not with the soul as such, but only with a part of it - the rational soul (al-nafs al-natika) or the intellect (‘aql), in line with the tradition of the classical Islamic philosophy . The author's technique is to analyse the characteristics of the definition of the intellect in order to draw out its essence . The intellect impresses a form upon our sense data and what we know can either be acquired (mustafad) from outside by ourselves or not . Bakr al-Mawsili argues that the intellect does not acquire knowledge by means of contact with a transcendent being but rather by reflection of the intellect upon itself . We can indeed make mistakes (e.g. be misled by imagination) but not if we reflect rationally upon the first principles (al-‘awâ'il) or logical thought, since they are the ground upon which the truth or falsity of everything else depends. These universals (al-‘umûr al-kulliyât) are true, real in themselves and their own objects, and are not equivalent to the body . Figure 6: Munajat (Confidential Talks) of 'Ali ibn Abu-Talib in a non-illustrated manuscript dated ca. 1200 CE, from Iraq, possibly Mosul. 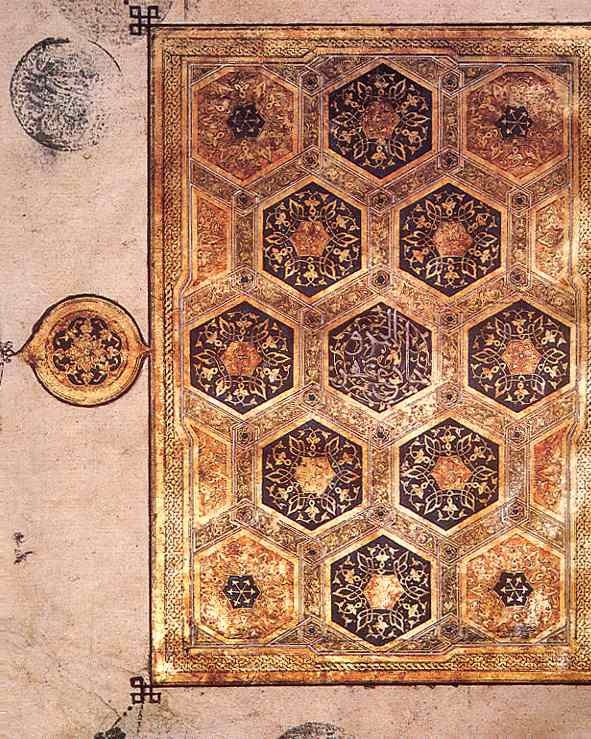 Ink, gold, and opaque watercolor on paper; morocco leather binding. The Metropolitan Museum of Art, New York, accession number 1995.324. 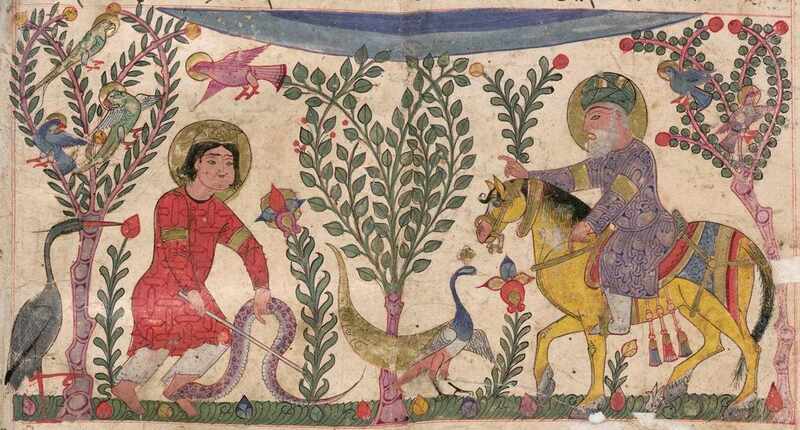 The similarity of the calligraphy of its title and the surrounding illuminated scrolls to another manuscript dated and attributed to Mosul provides the basis for attributing this piece. (Source). Ali Ibn al-Imrani (d. 955), who was born and lived in Mosul, was a mathematician, astronomer, geometer and teacher of Al-Qabisi. He was the author of Sharh Kitab al-Jabr wa-'l-Muqabala li-Abi Kamil (Commentary on the Book of Algebra and Almucabala of Abu Kamil) . Abd al-Aziz ibn Uthman ibn ‘Ali al-Qabisi (fl. 10th century), a well-known pupil of Al-Imrani, was known in Latin as Alcabitius . His mathematical work is Risala fi anwâ' al-‘adad (Treatise on the kinds of numbers), kept in Istanbul (SM AS 4832/17), whilst the rest of his works are on astronomy and studies of the stars . Among the latter can be included Risala fi al-ab'âd wa-'l-ajrâm (treatise on distances and bodies), which has been quoted subsequently by al-Biruni in his Sharh Kitab al-Fusul li-al-Farghani (commentary on the book of sections of al-Farghani). Al-Qabisi's other work of astronomy is the Shukuk fi al-Magisti (Doubts Regarding the Almagest) . The contents of this text seem to have been lost forever, as no manuscript of the book reached us so far, but they must have been written from the perspective of the criticism against Ptolemaic astronomy that began to be developed a century earlier . Al-Qabisi also wrote a treatise on determining the sizes and distances of planets, kept in manuscript form in Dublin (Chester Beaty Library, MS 5254), and another one entitled Hal al-Zîjat (Solving astronomical tables) . A number of treatises on the eye were written at different times by the Arabic-speaking physicians. In 850 a book was published entitled Daghal al-'Ayn, followed by Hunayn ibn- Ishaq's Ten Treatises on the Eye, the first systematic textbook on ophthalmology; and following Hunayn's treatise the later Muslim medical writers included sections on ophthalmology . Furthermore, independent works on anatomy of the eye and medical as well as surgical treatment of its diseases started to flourish. Zafer Wafaei was able to collect 39 such books specialized in ophthalmology written by 25 authors in the period between the 9th and 14th centuries . Casey Wood describes the many specialized instruments used by the Muslim surgeons, among them the forerunner of the injection syringe, the hollow needle or cannula for extracting soft cataracts . The Muslims played a fundamental role in practical ophthalmology in the matter of cataract. They stated that it was due to a pouring out of humour into the eye, which collected in the locus vacuus between the pupil and the lens, thus abstracting the visual power, and by clearing this empty space vision could be restored . Figure 7a-b: Two images from the illustrated manuscript of Kitab al-diryaq from Mosul School, mid-13th century CE; Vienna, Nationalbibliothek, MS AF 10: (a). A Seljuq court (Source 1); (b) a scene with animals. (Source 2). The treatise is an Arabic biographical dictionary, of which the content concerns the theriac, the famed 'universal antidote' of Antiquity. The book's unifying feature as a collective biography is the physicians' contribution to the development of the theriac; each physician's recipe follows his biography. ‘Ammar Ibn ‘Ali (11th century, Latin name Canamusali) of the city of Mosul developed the operation the soft cataract by suction. As described in his book Al-Muntakhab fi ‘Ilm al-‘Ayn wa-‘ilaliha wa-mudawatiha bi-al-adwiya wa-‘l-hadid (The Book of Selections in Eye Diseases and its Medical and Surgical Treatment, this operation consisted of introducing a hollow needle through the sclerotic membrane and extracting the lens by suction. This avoided an incision into the anterior chamber and the consequent loss of aqueous humour . The suction ought to be moderate and continuous for both purposes to achieve its dual aim of sucking in the cataract and avoiding a return of the sucked substance into the eye . Leclerc notes that the treatise by ‘Ammar Ibn ‘Ali Al-Muntakhab fi ‘Ilm al-'Ayn is extant at the Escorial Library in Madrid (Casiri catalogue, MS No 880) . The treatise is divided into two parts: one deals with cures for eye diseases, the other is dedicated to surgical operations . The treatment contains many clear descriptions of diseases and treatments arranged in logical order. The surgical part is especially important, as it describes for instance six operations for cataract, notably the operation for soft cataract by suction . ‘Ammar's treatise was very well translated into Hebrew by Nathan ha-Meati, who flourished in Rome in the second half of the 13th century, whilst a German version has appeared in 1905 . That German translation was recently translated into English then edited by Wafaei in 1993 . Students in surgery studied in the hospitals and had bedside teaching, observing in small groups the surgeons on their rounds and during operations. ‘Ammar Ibn ‘Ali said that he was accompanied by two or three students when he operated . Both in medicine and surgery these statements have a modern ring and considering the lack of modern methods of diagnosis, the methods of teaching were indeed sound . In the time of the Baghdad caliphate, the supervision of the teachers of medical students and pharmacists was delegated to an official known as the Muhtasib, or inspector general. Among his duties was the administration of a form of the Hippocratic oath to the students entering the profession of medicine or surgery . There is a question whether the name of the following scholar is Abu Bakr Muhammad Ibn ‘Abd al-Baqi al-Baghdadi or Al-Mawsili, but his work on mental reckoning al-Risala al Muhadhahabiya fi al-hisab al-hawâ'i which is located in Istanbul (Aya Sofia, MS 2738), calls him Ibn al-Baqi al-Mawsili . Ibn Baqi al-Mawsuli al-Faradi was born in 1050 and died in 1141. He was known by the names of Qadi al-Maristan and Abu Bakr al-Maristani (Qadi: Judge; Maristan: Hospital). He was a jurist, mathematician and astronomer and was knowledgeable in inheritance calculations. As a mathematician, he wrote a commentary on book X of Euclid's Elements, of which there are manuscripts of medieval Latin translations under various titles in Cambridge, Paris and Krakow in Poland . The Cambridge manuscript is titled De numeris et lineis (On numbers and lines) in the medieval collection of translations by Gerard of Cremona. Ibn al-Baqi also wrote Jadawil al-Jayb al-Mahlul al-Daqiqa (detailed tables of sines for each minute), which is now found in Cairo (MS V 280/1). He also wrote Risala fi Taqrib Usul al-Hisab fi' al-Jabr wa-‘l-Muqabala (Treatise on approximation of principles of arithmetic in algebra and al-muchabala) which is today found in Damascus (National Library, MS 6000) . His book on measurements (Kitab al-Misaha) is also known as Kitab al-Tabaqat fi Sharh al-Misaha), and is found in both Istanbul (MS Fatih 3439/17) under the second title and in St. Petersburg (Nat. Firk., MS 143) under the first title . Ibn al-Athir (d. 1233) flourished in Mosul. He belongs to a family of learned brothers. He travelled rarely and then, only for pilgrimage and for some short visits around Iraq and Syria. This is understandable as those days were very unsafe times, the Crusade threats were very high, and the Mongols having already devastated the Islamic East under Genghis Khan (1219-1221) were soon to devastate it even more under Hulagu (in the 1250s). Ibn al-Athir is the author of Kitab al-kamil fi al tarikh (The perfect in history), a general history  of the Islamic world up to 1231, in fourteen volumes . This work has been edited by the Danish Orientalist C.J. Tornberg and is, according to Dunlop, with The Annals of al-Tabari, one of the most highly valued sources of Islamic history, highly reliable and readable. It has been much studied by scholars of Islamic history in the West, including Amari, who wrote the excellent work on Muslim Sicily and who relied to great extent on Ibn Al-Athir . The Englishman Sir William Muir, who was to act late in the 19th century as Lt-General governor of India's North Western province, also uses him as his chief guide after al-Tabari . The French scholar Fagnan uses Ibn al-Athir in his study of the Maghrib, Sicily and also Spain . In the book, amongst other episodes, is described the capture of Antioch by the crusaders in 1098, a crusade the author sees as part of a three pronged attack by the Christian world against the Islamic world: in Spain, in Sicily, and in the Holy Land . "If God in His mercy had not granted that the Atabeg Zangi should conquer Syria, the Franks would have overrun it completely… (the last Muslim leader Zahir ad-Din Tughtikin had died in this year 1128), Syria was left completely at their mercy with no-one to defend its inhabitants, but God in his mercy to the Muslims was pleased to raise to power Imad ad-Din Zangi ." "It is on 14 September 1146 the Atabeg Imad ad-Din Zangi ibn Aq Sunqur, martyr for the Faith, ruler of Mosul and Syria, was killed… his murderers fled to the fortress, whose inhabitants joyfully shouted the news to the besieging camp… My father recalled: ‘I went straight to him; he was still alive, and when he saw me, clearly wanting to make an end of it he made a sign to me with his fingers imploring me to take pity on him. At the very suggestion I fell to the ground and said: ‘My Lord, who has done this?' But he was beyond speech, and yielded up his soul, may the Lord have mercy on him' ." Abu Shuja' Muhammad ibn 'Ali ibn Shutaib ibn al-Dahhan (son of the oilman), Fakhr al-din al-Baghdadi flourished in Mosul amongst other places and died at al-Hilla in 1194 on his way back from Mecca to Damascus . He was a Shafi'ite legist, arithmetician, calculator of inheritance shares, and astronomer . In 1167-1168 he completed legal tables (Taqwim al-nazar) divided into ten columns, giving for each question the views of the four Sunni schools, the principles involved, and additional observations. These tables are preceded by an introduction dealing with grammar and logic . The Taqwim al-nazar fi al-masa'il al-khilafiya is still unpublished. 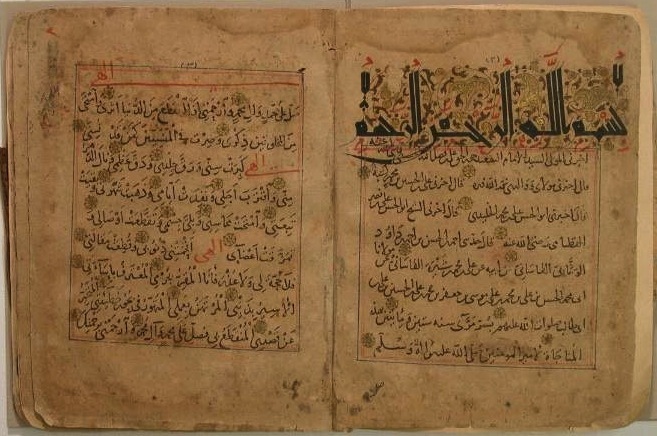 Dawud al-Naser al-Mawsili, who lived during the 12th century, is the author of a medical formulary which is entitled Nihayat al-Idrak (The End of Perception), which can be located at the French National Library (old fund, MS 1036) . Herbelot states that it was dedicated to Salah al-Din's brother Al-Malik al-‘Adil, hence the other title for the treatise Al-‘Adeli . The Paris manuscript is incomplete and begins with the third book, and contains 250 pages which are divided into 72 parts, dealing with unguents, powders, injections, fumigations, narcotics, haemostatics, oils and perfumes . It also includes diets for the sick, doses of medicines, synonyms and effects of medicines; some such medical preparations to be effected in the shops, others in hospitals . Narcotics, the author says, can be used to perform surgical operations on young persons, and also to open abscesses and to extract calculus . Al-Harawi (d. 1214-5) was born in Mosul and flourished in the second half of the 12th century. He was a Muslim traveller who visited Jerusalem in 1173-4 and who also visited Europe, witnessing an eruption of the volcano Etna in Southern Italy . In 1191 he was caught at sea by the fleet which was taking the English King Richard to the siege of Acre and he then lost a part of his notes . He wrote a guide book for the pilgrims, entitled Kitab al-Isharat fi Ma'rifat al-Ziyarat (Book on the indications for the knowledge of travels) . Baha' al-Din (1145-1234) was a Mosul historian of the crusades. He entered Salah al-Din's service in 1188, was appointed as Qadi (judge) to the army and remained a loyal member of the Sultan's household until Salah al-Din's death. Under his successors, he was appointed Qadi of Aleppo. His most famed work is An-Nawadir al-Sultanyia (Sultanly Virtues). It is Baha al-Din who gives us the most complete portrait we have of the Sultan as the Muslims saw him and also a vivid account of the third Crusade . "The marquis, the ruler of Tyre, was one of the most cunning and experienced of the Franks, and his was the chief responsibility for luring the crowds of the Crusaders from overseas. He had a picture of Jerusalem painted showing the Church of the Resurrection, the object of pilgrimage and deepest veneration to them; according to them the Messiah's tomb is there, in which he was buried after his crucifixion. This sepulchre was the object of their pilgrimage, and they believed that every year fire came down upon it from heaven at one of their feasts. Above the tomb the Marquis had a horse painted, and mounted on it a Muslim knight who was trampling the tomb, over which his horse was urinating. This picture was sent abroad to the markets and meeting places; priests carried it about, clothed in their habits, their heads covered, groaning: `O the Shame!' In this way they raised a huge army, God alone knows how many, among them the King of Germany with his troops ." Kamal al-Din ibn Yunus comes from a renowned family of scholars of Mosul, where he was born and died in 1242. He is also known as Kamal al-Din ibn Man'a . He became a man of great renown in his time after studying medicine in his father's school before completing his studies in Baghdad . When his father died, he replaced him as a teacher, his brother was also a teacher in the college which, in his honour, then bore the name of the Kamalic College . In his autobiography, the historian-medical scholar Abd al-Latif tells that Kamal al-Din ibn Yunus was an extremely able mathematician . Amongst his students was Theodorus, to whom he explained Al-Farabi, Ibn Sina, Ptolemy and Euclid . Kamal al-Din Ibn Yunus was an encyclopaedist who wrote commentaries on Ibn Sina, the Quran and various other treatises on Arabic grammar, logic and the stars . He is also a mathematician of great renown . He wrote indeed on arithmetic, algebra, square numbers, magic squares, regular heptagons, etc . The geographer-historian Al-Qazwini tells that when the crusaders, under Frederick II, came to the East, they sought solutions to questions of medicine, philosophy, and mathematics. The last question of theirs was only solved by Kamal al-Din  One of the questions solved by him was how to construct a square equivalent to a circular segment. The solution was proved by one of his pupils, Al-Mufaddal ibn ‘Ummar al-Abhari, who wrote an essay on it . Al-Mufaddal Ibn ‘Umar al-Abhari (d. 1263) was born in Abhar, Jibal, and flourished in both Mosul and Irbil. He was a philosopher, a mathematician and astronomer . Besides his contribution cited above, he wrote a guide in philosophy (Hidayat al-Hikma) which is preserved in a number of manuscripts in India, and an introduction to logic which has been translated into both Latin and English . He also wrote a treatise on the compass, on equations (Kitab al-Mu'adalat), a concise Zij (astronomical table) according to observations, a book on astronomy (Kitab fi ‘Ilm al-Hay'a), and another which is an abridged form of the astronomy of Kushyar and Jabir Ibn Aflah, which can be found in various libraries around the world . He completed another work on the astrolabe Risala fi Ma'arifat al-Astrulab, which is also kept in Cairo and Istanbul, as well as a treatise on the Rules of comprehension on the knowledge of celestial spheres (‘Aqâ'id al-Idrâk fi Dirâyat al-Aflâk) (MS Oxford, I 940/9) and a final work to be mentioned here concerning the operations with the astrolabe . Mosul is also famed for its metal works and in the 13th-century an Islamic globe was crafted at the famous metalwork school that flourished in the city. This globe was made by Muhammad Ibn Hilal al-Munajjim al-Mawsili (the astronomer of Mosul) in 674 H/1275-76 CE. Emilie Savage-Smith tells us that nothing is known of this maker except this one product, but judging by his name, he was an astronomer from Mosul who was probably trained in metal working at the great centre there . The globe is made of two metal hemispheres with 48 engraved constellations and about 1025 stars indicated by inlaid silver points with the inscriptions in Kufic script . The globe has a 240 mm in diameter and includes the words sharq, gharb, shimal and janub (meaning the cardinal directions E, W, N, S) on the circumference of the horizon . The globe was preserved in the rooms of the Royal Asiatic Society in London where it was well-described by Dorn . Now the globe has been moved to the British Museum in London (inventory number OA 1871 3-1.1) . The globe is a handsome example of Islamic metalwork and fine instrument-making and compares favourably with other products of the Mosul school . 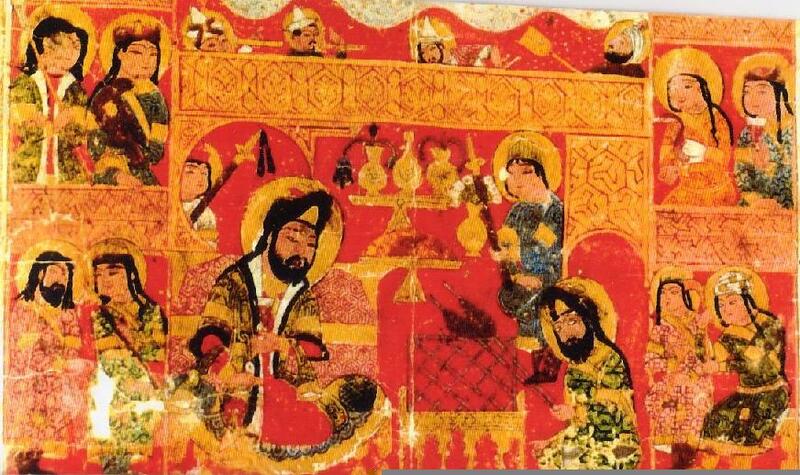 Another man of Mosul also famed for his instruments is Muhammad B. Khutlukh al-Mawsili who, in 1241-2, compiled a prognostication table, formerly in the Posno collections but now at the British Museum (inventory number 1888. 5-26.1) . Lane Poole has reproduced a plate of this globe in his work on Salah al-din, Saladin: All-Powerful Sultan and the Uniter of Islam (1898) . Abd Allatif al-Baghdadi: Relations d'Egypte, edited by M. S. De Sacy. Paris: Imprimerie Générale, 1810-11. E. Ashtor: A Social and Economic History of the Near East in the Middle Ages. London: Collins, 1976. Ibn al-Athir: Tarikh al-Dawla al-Atabakiya: Muluk al-Mawsil; in Recueil des historiens des croisades. Paris, 1871, vol. 11-2, pp. 1-394. Ibn al-Athir: Kitab al-kamil; ed K. J. Tornberg, 12 vols. Leiden, 1851-72. Ibn al-Athir: Tarikh al-Dawla Al-Atabakiyya. Edited by Abd Al-Qadir Ahmad Tulaymat, Cairo, 1963. Baha Eddin: Ibn Shadad: Nawdir asultania; in Receuil des Historiens Orientaux. Paris, 1884, vol. 3. Bakr al-Mawsili, Fi al-Nafs. London: British Museum, MS Add. 7473, folios 6a-12a. Sharaf Khan Bidlisi: Scheref Nameh ou Fastes de la nation kourde; translated by F.B. Charmoy. St Petersburg, 1868-75. C. Bouamrane, Louis Gardet : Panorama de la pensée Islamique. Paris : Sindbad, 1984. C. Brockelmann: History of the Islamic peoples. London: Routledge, 1950. Baron Carra de Vaux: Les Penseurs de l'Islam. Paris: Geuthner, 1921. D.Campbell: Arabian Medicine and its Influence on the Middle Ages. Amsterdam: Philo Press, 1926; reprinted 1974. Al-Djahiz: Al-Tabsira bi-'l-Tijara, edited by H. Abd al-Wahab. Revue de l'Academie Arabe de Damas, 1932, vol. 12, pp. 326-51. B. Dorn: "Description of a Celestial Globe Belonging to Sir John Malcom, Deposited in the Museum of the Royal Society", Transactions of the Royal Asiatic Society, vol 2, 1830, pp. 371-92. C. Elgood: A Medical History of Persia. Cambridge University Press, 1951. F. R. Farag: "Why Europe Responded to the Muslims", Arabica, vol. 25, 1975, pp. 292-308. D. R. Hill: Islamic Science and Engineering. Edinburgh University Press, 1993. J. Hirschterg: Die arabischen Lehrbucher der Augenheilkunde, in Abhdl. der preuss. Akad. der Wiss., Berlin, 1905. J. Hirschberg, J. Lippert, and E. Mittwoch: Die arabischen Augenarzte nach den Quellen bearbeitet. Leipzig, 1905, vol 2. H. Honigmann: "Mosul", Encyclopaedia of Islam, 1st series, vol 3, pp. 609- 11. E. Honigmann and C.E. Bosworth: "Al-Mawsil", Encyclopaedia of Islam, New Series, vol. 6, 1991, pp. 899-902. Ibn Jubair: Voyages, translated with notes by M. Gaudefroy Demombynes. Paris, 1949-65. J.H. Lamonte: "Crusade and Jihad", in The Arab heritage, edited by N. A. Faris. Princeton University Press, 1944, pp. 159-198. S. Lane Poole: Saladin. London, 1898. L. Leclerc: Histoire de la Médecine Arabe. Paris, 1876, 2 vols. L.A. Mayer: Muslim Astrolabists and their Works. Geneva: Albert Kundig, 1956. Al-Muqaddasi, The Best Divisions for Knowledge of the Regions - Ahsan al-Taqasim fi Ma'rifat al-Aqalim, translated by Basil Collins. Reading: Garnet Publishing, 1994, 2nd ed. 2001. S. Pines: La doctrine de l'intellect selon Bakr al-Mawsili, Studi orientalistici in onore di Giorgio levi della Vida. Roma, 1956, vol. 2, pp. 350-64. B.Rosenfeld and E. Ihsanoglu: Mathematicians, Astronomers and other Scholars of Islamic Civilisation. Istanbul: Research Center for Islamic History, art and Culture, 2003. G. Sarton, Introduction to the History of Science, Baltimore: Williams & Wilkins, 1927-48, 3 vols. E. Savage Smith: Islamicate Celestial Globes. Washington DC: Smithsonian Institution, 1985. R.B. Sergeant: Islamic Textiles. Beirut: Librairie du Liban, 1972. P.P. Soucek: "Islamic Art and Architecture", Dictionary of the Middle Ages, vol 6, pp. 592-614. H. Suter: Die mathematiker und Astronomen der Araber und ihre Werke (1900). Amsterdam: Oriental Press, 1982. The Arabian Nights: translated by E.W. Lane. New York, 1927. The Book of Ser Marco Polo; Trans and annoted by H. Yule. London, 1875. H. Honigmann, "Mosul", First Encyclopaedia of Islam, Leiden: Brill, 1913-36, vol. 3, pp. 609-611. This tax is the Jizya which is money paid in compensation for harm done and for costs of defending the area which the person or group paying doesn't take part in. H. Honigmann, "Mosul", op. cit., p. 609. Ibn Fakih, Compendium Libri Kitab al-Boldan Auctore Ibn al-Fakih al-Hamadhani, edited by M.J. de Goeje, Leiden 1885, Reprint Leiden, 1964-65, p. 128; Yaqut b. 'Abdallah, Mu'jam al-Buldan, edited by F. Wustenfeld, Leipzig, 1868, vol. 4, pp. 682-4. See A. S. Tritton and H. A. R. Gibb "The First and Second Crusades from an Anonymous Syriac Chronicle," Journal of The Royal Asiatic Society, vol. 65, Issue 2, April 1933, pp 69-101; and J.H. Lamonte, "Crusade and Jihad," in The Arab heritage, edited by N. A. Faris, Princeton University Press, 1944, pp. 159-198. Baron G. D'Ohsson, Histoire des Mongols, 4 vols., La Haye and Amsterdam: Les Frères Van Cleef, 1834; S. Runciman, A History of the Crusades, Cambridge University Press, 1951, 2 vols. Al-Muqaddasi, The Best Divisions for Knowledge of the Regions - Ahsan al-Taqasim fi Ma'rifat al-Aqalim, translated by Basil Collins, Reading, Garnet Publishing, 1994, 2nd ed. 2001, p. 117. H. Honigmann, "Mosul", op. cit., p. 610. Al-Muqaddasi, Ahsan al-Taqassim, op. cit., p. 117. H. Honigmann, "Mosul", op. cit., p. 611. For more on Mosul, see Ibn al-Athir, Tarikh al-dawla al-Atabakiya Muluk al-mawsil, in Recueil des historiens des croisades, vol. 11.2, Paris, 1871, pp. 1-394. P.P. Soucek, "Islamic Art and Architecture", Dictionary of the Middle Ages, vol 6, pp. 592-614; p. 607. D. R. Hill, Islamic Science and Engineering, Edinburgh: Edinburgh University Press, 1993, pp. 87-8. R.B. Sergeant, Islamic Textiles, Beirut : Librairie du Liban, 1972, pp. 38-9.p> Ibid, p. 38. Al-Djahiz, Al-Tabsira bi-al-Tijara, edited by H. Abd al-Wahab, Revue de l'Académie de la Lange Arabe de Damas, vol. 12, 1932, pp. 326-51; p. 347. Al-Tha'âlibî, Lata'if al-Ma'ârif, Brill, 1876, p. 111; quoted in R.B. Serjean, Islamic Textiles, op. cit.,p. 38. The Arabian Nights, translated by E.W. Lane, New York, 1927, p. 44. The Book of Ser Marco Polo, translated and annoted by H. Yule, London, 1875, vol. 1, p. 62. Sharaf Khan Bidlisi, Scheref Nameh ou Fastes de la nation kourde, translated by F.B. Charmoy, St. Petersburg, 1868-75, vol. 1, p. 224. The Book of M. Polo, op. cit., vol. 1, p. 62. Ibn Jubair, Voyages, translated with notes by M. Gaudefroy Demombynes, Paris, 1949-65, p. 235. Bakr al-Mawsili: Fi al-Nafs, British Museum, MS Add. 7473, folios 6a-12a. O.N. H. Leaman, "Al-Mawsili," Encyclopaedia of Islam, New Series, Leiden, vol. 6, p. 903. Shlomo Pinès, "La doctrine de l'intellect selon Bakr al-Mawsili," in Studi orientalistici in onore di Giorgio levi della Vida, Roma, 1956, vol. 2, pp. 350-64. O.N. H. Leaman, "Al-Mawsili," op. cit.,p. 903. B. Rosenfeld and E. Ihsanoglu, Mathematicians, Astronomers and Other Scholars of Islamic Civilisation, Istanbul: Research Center for Islamic History, Art and Culture, 2003, p. 79. George Saliba, History of Arabic Astronomy: Planetary Theories During the Golden Age of Islam, New York University Press, 1994, p. 20. B. Rosenfeld and E. Ihsanoglu, Mathematicians, Astronomers and Other Scholars of Islamic Civilisation, op. cit., p. 85. A. Whipple, The Role of the Nestorians and Muslims in the History of Medicine. Microfilm-xerography by University Microfilms International, Ann Arbor, Michigan, 1977, p. 69. Z. Wafaei, The Arabian Ophthalmologists. Compiled from original texts by J Hirschberg, J Lippert and E Mittwoch, translated into English by F R Blodi, W J Rademaker, Gisela Rademaker and K F Wildman, edited by M. Z. Wafaei. King Abdulaziz City for Science and Technology, Riyadh, 1993, pp 13-29. Casey Wood, Memorandum Book of a Tenth-Century Oculist. A Translation of the Tadhkirat of Ali ibn Isa of Baghdad (cir. 940-1010 A.D.), the Most Complete, Practical and Original of All the Early Textbooks on the Eye and Its Diseases (Northwestern University, 1936); cited by EIgood, A Medical History of Persia, op. cit., p. 286. F. R. Farag, "Why Europe Responded to the Muslims", Arabica, vol. 25, 1975, pp. 292-308; p. 299. L. Leclerc, Histoire de la Médecine Arabe, 2 vols., Paris, 1876, vol. 1, p. 535. L. Leclerc, Histoire de la Médecine Arabe, op. cit., vol. 1, p. 536. J. Hirschterg, "Die arabischen Lehrbucher der Augenheilkunde," Abhdl. der preuss. Akad. der Wiss., Berlin, 1905. J. Hirschberg, J. Lippert, and E. Mittwoch, Die arabischen Augenarzte nach den Quellen bearbeitet, vol. 2, Leipzig, 1905. Z Wafaei, The Arabian Ophthalmologists, op. cit. Casey Elgood: A Medical History of Persia, Cambridge University Press, 1951, p. 236. A. Whipple, The Role of the Nestorians and Muslims in the History of Medicine, op. cit., p. 60. B.Rosenfeld and E. Ihsanoglu, Mathematicians, Astronomers and Other Scholars of Islamic Civilisation, op. cit., p. 171. Kitab al-kamil fi al tarikh has been edited by Carl Tornberg, Ibn al-Athir Chronicon quod perfectissinum inscribitur, 14 vols., Leiden, 1851–1876. Baron Carra de Vaux, Les Penseurs de l'Islam, Paris: Geuthner, 1921, vol. 1, p. 122 ; C. Bouamrane, Louis Gardet, Panorama de la pensée islamique, Paris: Sindbad, 1984, pp. 252-66. Sir William Muir, The Caliphate, Preface to the 2nd edition. Barron Carra de Vaux, Les Penseurs, op. cit., p. 123. Ibn al-Athir, Kitab al-kamil, ed C.J. Tornberg, op. cit, vol. 10, p. 112. Ibid, vol 11, p. 72. G. Sarton, Introduction to the History of Science, Baltimore: Williams & Wilkins, 1927-48, 3 vols., vol. 2: From Rabbi Ben Ezra to Roger Bacon, p. 462. H. Suter, Die mathematiker und Astronomen der Araber und ihre Werke (1900), reprint Amsterdam: Oriental Press, 1982, p. 126. F. Wustenfeld, Die Geschichtschreiber der Araber und ihre Werke, Vienna, 1882, N° 281, p. 98. G. Sarton, Introduction to the History of Science, op. cit., vol. 2, p. 462. L. Leclerc, Histoire de la Médecine Arabe, op. cit., vol. 2, p. 48. G. Sarton, Introduction to the History of Science, op. cit., vol. 2, p. 413. For details, see Receuil des Historiens des croisades, Historiens orientaux, vol. 3, Paris, 1884. Baha Eddin (Ibn Shadad), Al-Nawadir al-Sultania, in Receuil des Historiens Orientaux, vol. 3, op. cit., p. 181. G. Sarton, Introduction to the History of Science, vol. 2, op. cit.,p. 600. L. Leclerc, Histoire de la Médecine Arabe, op. cit., vol. 2, p. 144. Abd Allatif al-Baghdadi, Relations d'Egypte, edited by M. S. De Sacy, Paris : Imprimerie Générale, 1810-11, p. 462. L. Leclerc, Histoire de la Médecine Arabe, vol. 2, op. cit., p. 144. H. Suter, Die mathermatiker und Astronomer der Araber, op. cit., pp. 140, 142. Abd Allatif al-Baghdadi, Relations d'Egypte, edited by M. S. De Sacy, op. cit., p. 462. G. Sarton, Introduction to the History of Science, vol. 2, op. cit., p. 600. B. Rosenfeld and E. Ihsanoglu, Mathematicians, Astronomers and Other Scholars of Islamic Civilisation, op. cit., p. 209. E. Savage Smith, Islamicate Celestial Globes, Washington D C: Smithsonian Institution, 1985, p. 26. G. Sarton, Introduction to the History of Science, vol. 2, op. cit., p. 1014. B. Dorn, "Description of a Celestial Globe Belonging to Sir John Malcom Deposited in the Museum of the Royal Society", Transactions of the Royal Asiatic Society, vol 2, 1830, pp. 371-92. L.A, Mayer: Muslim Astrolabists and their Works, Geneva: Albert Kundig, 1956, p. 68. E. Savage Smith, Islamicate Celestial Globes, op. cit., p. 26. L.A. Mayer: Muslim astrolabists and their works, op cit; p. 69. S. Lane Poole: Saladin; 189.